For any business, controlling who has access to information is a complex task. For any business, controlling who has access to information is a complex task. And it is complicated even further by regulations (such as the GDPR) that demand the implementation of IAG: the management and oversight of system access to ensure information protection. The trick is to simplify IAG so it can be understood and embraced throughout your organisation. 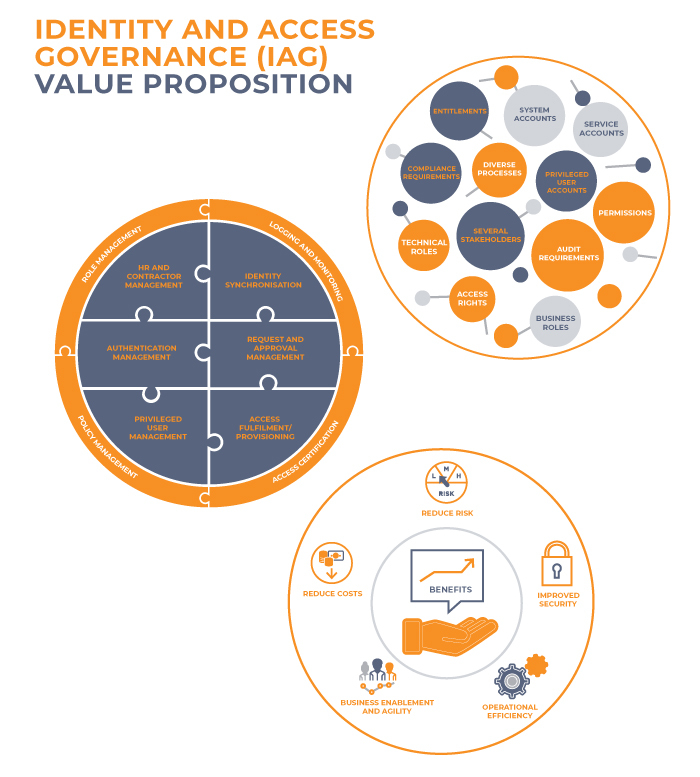 We apply our specialist knowledge to do exactly that, using a holistic approach that bridges the knowledge gap between governance, process and technology across the many stakeholder groups needed to create a successful IAG capability. Result? All your stakeholders are empowered to fulfil their new roles, with the tools and confidence to execute their responsibilities easily. This ensures a fit-for-purpose, sustainable solution that supports the protection of information, compliance with laws and regulations, risk reduction, and the realisation of business value.